anywhere across all your mobile devices. Access anytime, anywhere—see your Merrill Edge® investment and Bank of America® bank accounts online and on your mobile device. 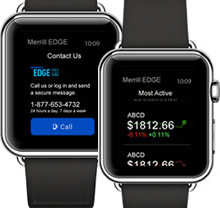 The Merrill Edge app gives you access to the tools to help you make more informed investing decisions on your iPhone®, iPad® or Android™ device. 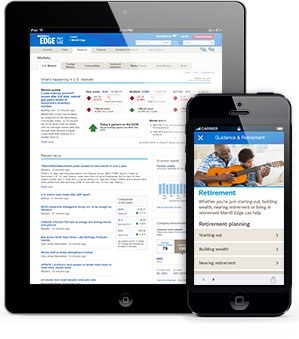 View your linked Bank of America banking and Merrill Edge investing account balances—all in one place. Trade stocks, ETFs, mutual funds and options, and review open orders. Check balances and holdings, including pending and past transactions. Get the latest quotes, analysts' ratings and up-to-the-minute news headlines. 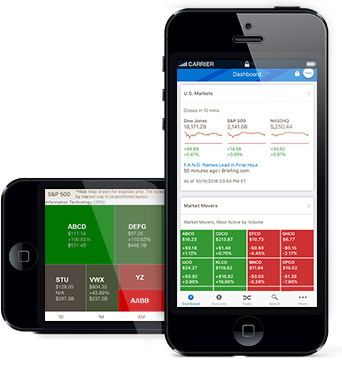 Set alerts to help you stay on top of your investing accounts and securities. Monitor, manage and create new watchlists on your device. Securely message Merrill Edge with any account questions. Our Guidance & Retirement center provides resources, interactive tools and calculators to help with planning for retirement, investing, college and life events. 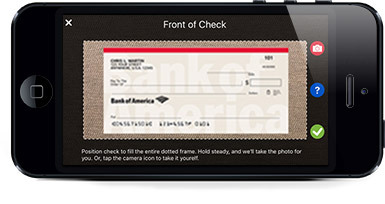 Deposit checks into your Merrill Edge account by simply snapping a picture—no more trips to the bank. Pay bills from your Merrill Edge account. Instantly transfer funds between your linked Merrill Edge and Bank of America accounts2, plus make transfers between Merrill Edge and accounts at other financial institutions. Just glance at your wrist to access market performance, monitor major indexes, view the day's most active stocks and track your watchlist. Don't own an iPhone, iPad or Android device? Visit the Merrill Edge mobile website from your smartphone's internet browser at merrilledge.com. No app required. Apple, the Apple logo, iPad and iPhone are trademarks of Apple Inc., registered in the U.S. and other countries. Apple Watch is a trademark of Apple Inc. App Store is a service mark of Apple Inc.
Footnote 1 Available on iOS and Android devices that support fingerprint login.